In late 2002 the company started operating 747-200 freighters, purchased from British Airways as passenger planes and converted to pure freighters by Haeco in Hong Kong. Most of the photos on this page are from the freighter, but there are also some others that I didn't fit to previous pages. On the left you can see the very large main freight deck, though it perhaps doesn't so large in that photo - Take note of the pressure bulkhead at the very rear of the plane, then look at the 1.8 metre/6ft tall Captain standing in front of it. The main deck has power-rollers on it to move the containers backwards & forwards to get them into the right place. 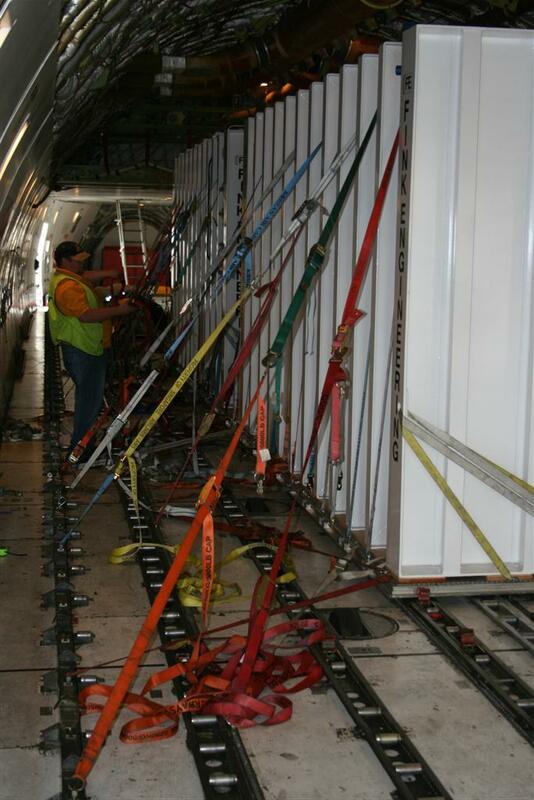 Speaking of loading freight in the right place, one hazard that all planes that have lots of weight moving backwards & forwards when loading can suffer is too much weight on the tail, so the nose lifts up into the air until the tail hits the ground. 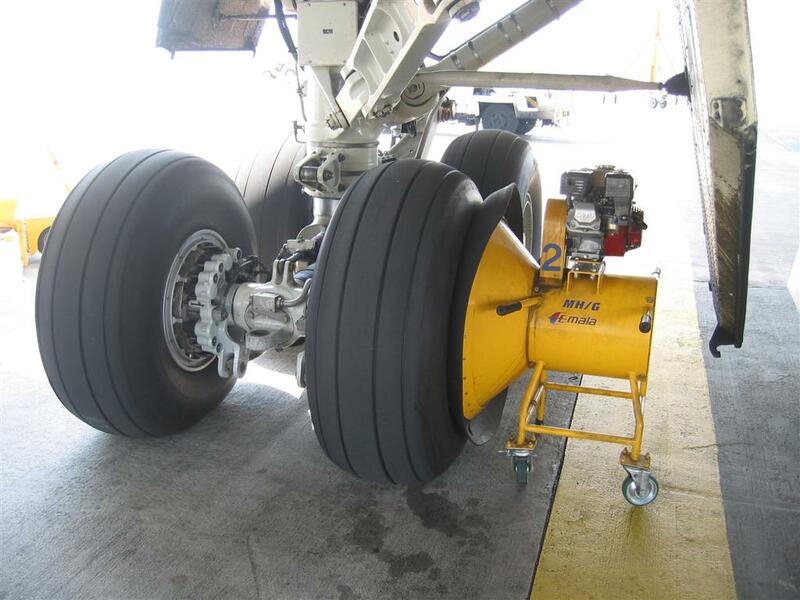 Most companies use a big strut that sits under the tail to stop it from moving, but some airports have a strap that holds the nosewheel down. This seems to be a much better idea to me, but it's not very common. The freighter, despite not carrying any passengers, still needs to have good airflow around the cabin as we often carry horses, goats, pigs, and other animals. 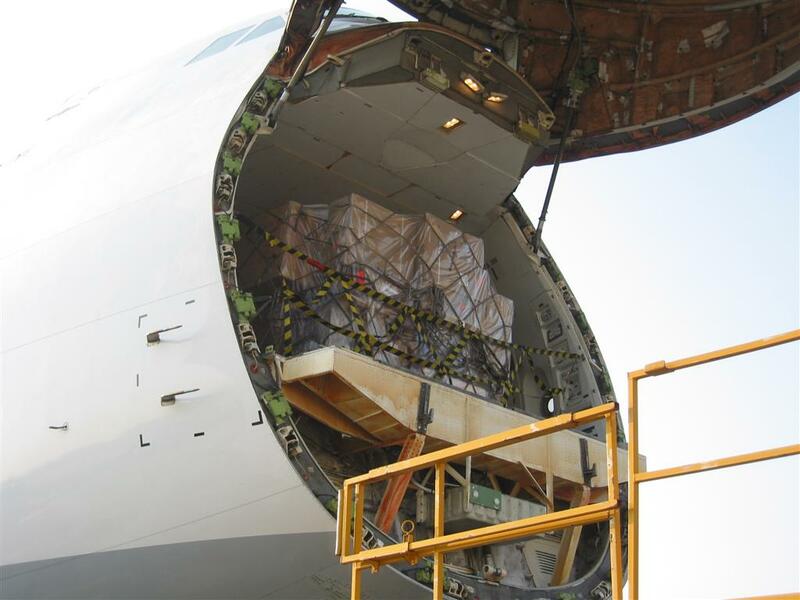 Most freight also needs to be kept at room temperature, so most of the air-conditioning system remains from the full passenger plane to the full freighter plane. 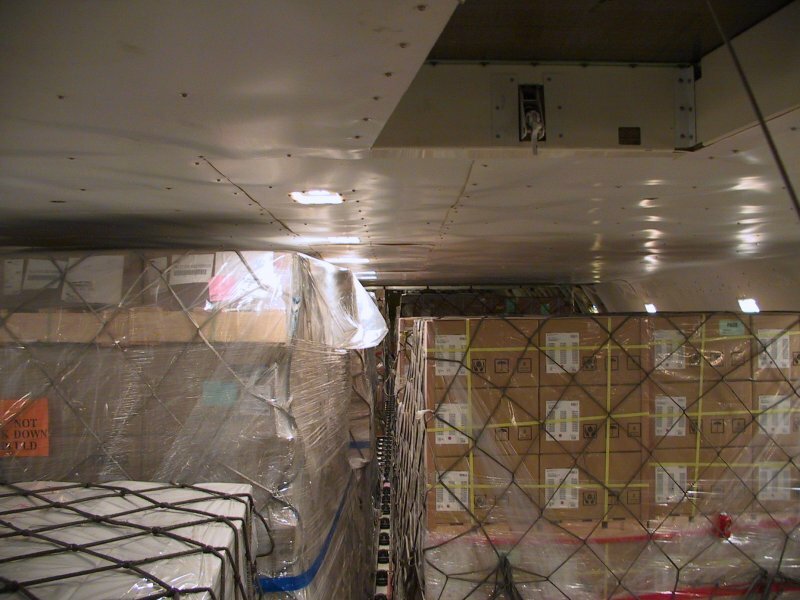 The photo shows some of the comprehensive air ducting that's inside the main freight deck of the 747. On the left of the photo, just where you can't see it, if the back of the upper deck. It's lower than the rest of the cabin as the floor of the upper deck sticks down a fair way. 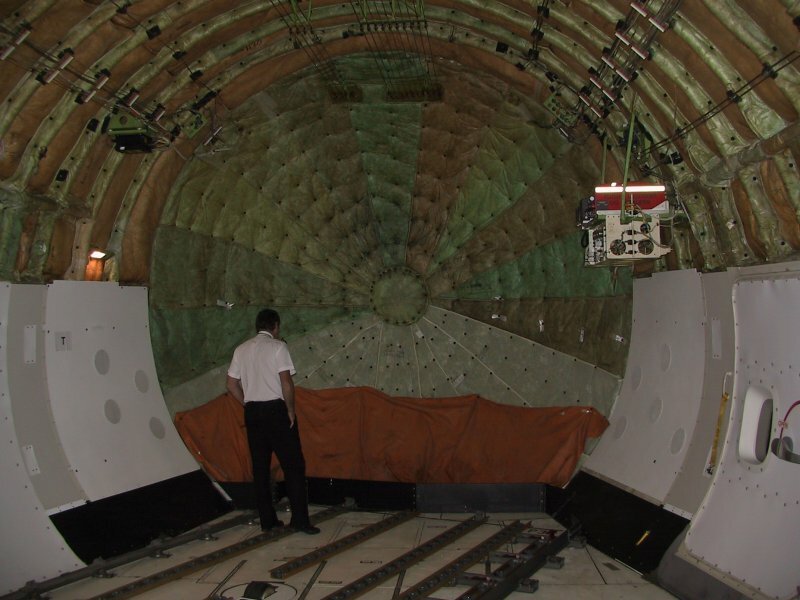 This means that 747 freighters that have the big nose-door (it pivots upwards) can only load freight of a certain height through the nose. The door down the back is much taller, so all the really big freight has to go through there - So in practice there's little disadvantage in having no front-loading system. From the odd unfortunate aeroplane accident you have no doubt heard about the famous 'black box' that always survives the accident. Well, as you can see from the photo on the right, they're not black, they're orange. 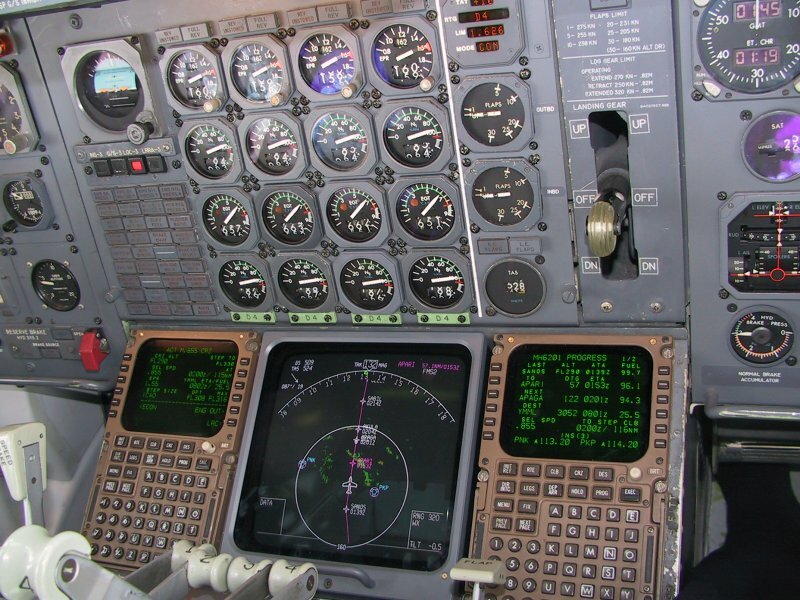 The one on the left is the Cockpit Voice Recorder and it records the last 30 minutes of sound in the cockpit before the power goes off. The reason for only 30 minutes is the when they were first introduced the US pilot's union stronlgy objected to anything longer than that because they were worried that the recordings would be wrongly used to convict pilots for things they said in general conversation. So a blanket 30 minutes was agreed on. This is generally more than enough but on odd occasions there have been accidents where the initial stage of the accident happened more than 30 minutes before and so the cause & discussion of that is lost. 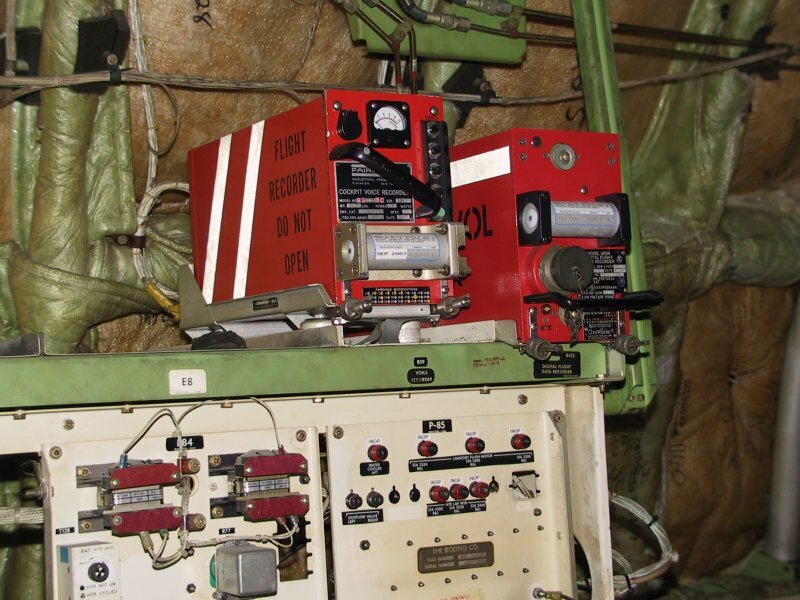 The box on the right is the Flight Data Recorder and it records a lot of things like power settings, control surface positions, altitude, heading, etc. It'll record through a 25 hour window. From the data it provides the flight path of the plane can be accurately determined, and so usually the cause of the accident. 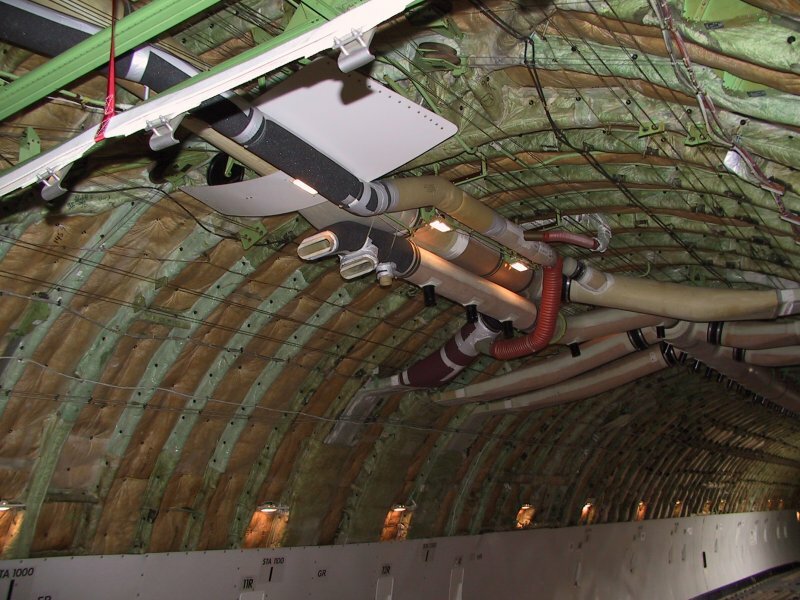 If you look at the photo right up the top-right of this page, the rear pressure bulkhead photo, you can see where the two boxes sit in the fuselage. 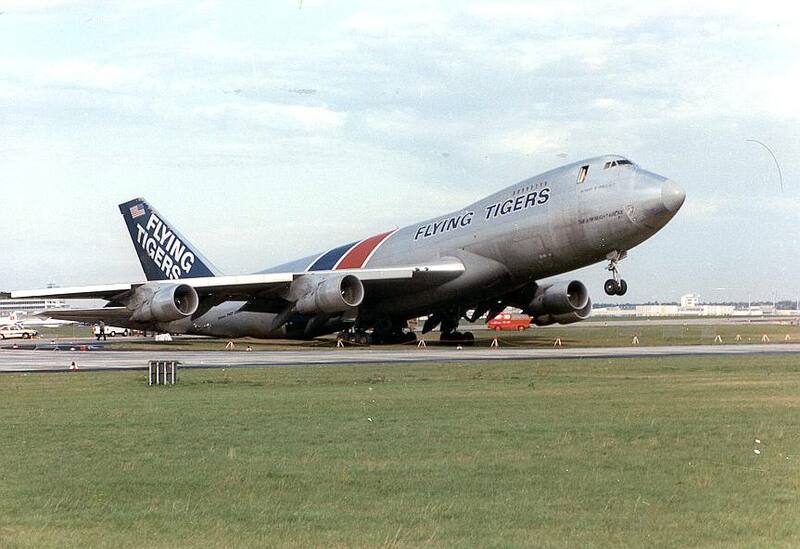 The 747-236 freighters we use were modified by British Airways a few years before we bought them, and they were fitted with a Honeywell F light Management System just like the 737 Classic, 757/767, 777, and 747-400 has. Apparently it turned out to be not that hard to do, as the systems were easy to integrate. 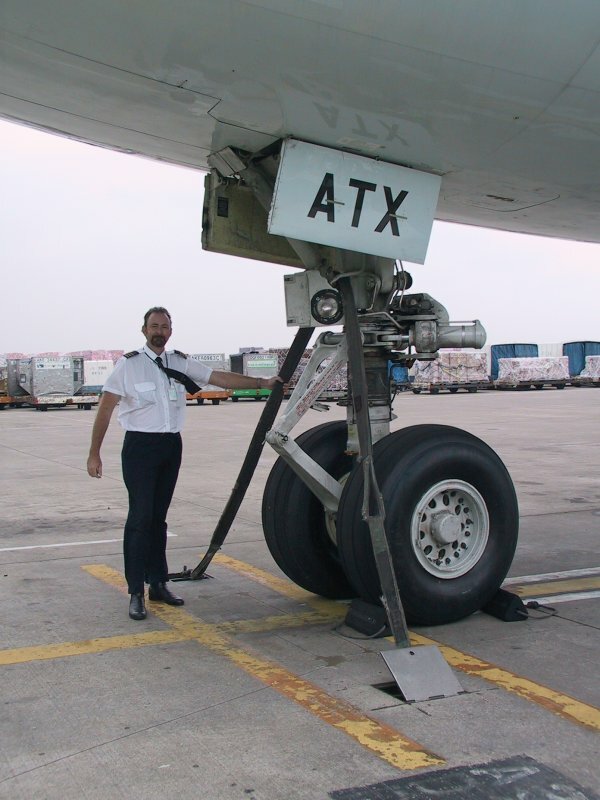 It allowed BA to run the planes more efficiently and far more accurately than before, thus saving fuel, etc. There was fifteen converted, Air Atlanta have three so the other twelve are still out there somewhere. (I think most are sitting out in a desert somewhere, in storage) The FMS is pretty easy to learn how to use, and once you get used to it, it's quite a handy tool. On the map display in the middle you can see how the weather is superimposed over the purple track line and that certainly makes it very easy to plot a track around bad weather. 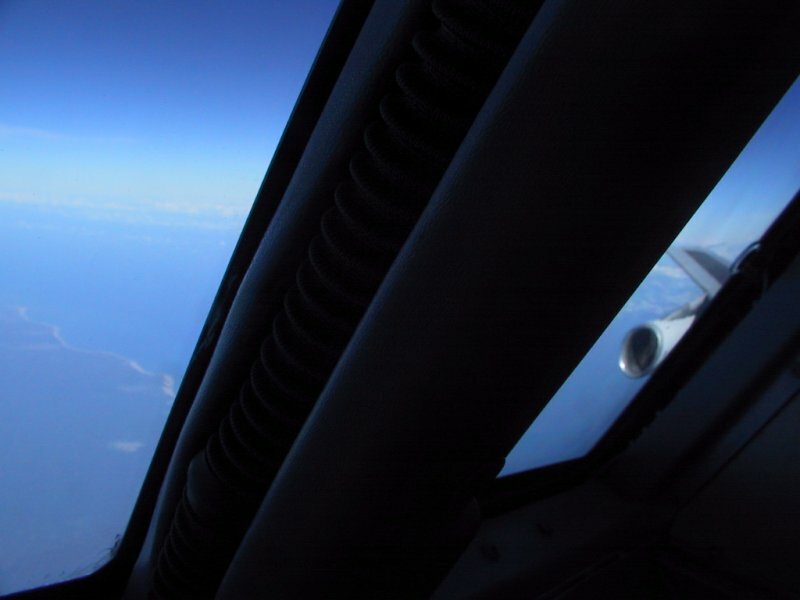 You can't see much from the cockpit in a 747, nothing of the nose of the plane and only the last bit of the wing. It's possible though, if you stick your head up against the window, to see the outboard engines and most of the cowling. The view is actually a little better than this, but it's hard to reproduce the exact scene with a camera. During the first couple of months of the year, the big Muslim pilgrimage to Mekka all around the world occurs - The Hajj. 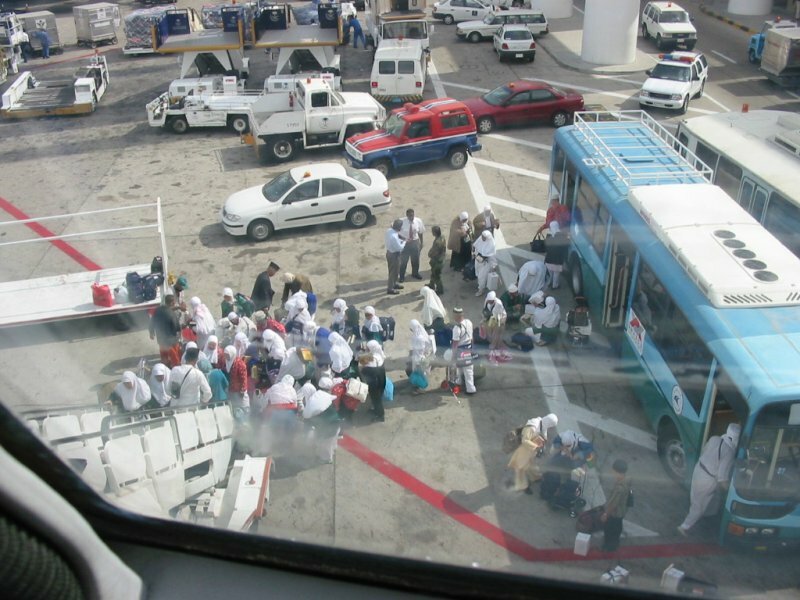 The result is semi-organised chaos most of the time, especially in Jeddah, Saudi Arabia, which is the closest international airport to Mekka. For the first half of the Hajj the Hajji's travel to Jeddah so the plane is full, with the plane being empty when leaving the country. On the second half the opposite occurs, with the planes arriving in Jeddah empty and leaving full. The Hajji's buy a lot of stuff to take back to remember the trip to Mekka, and they usually try to bring it on board with them. 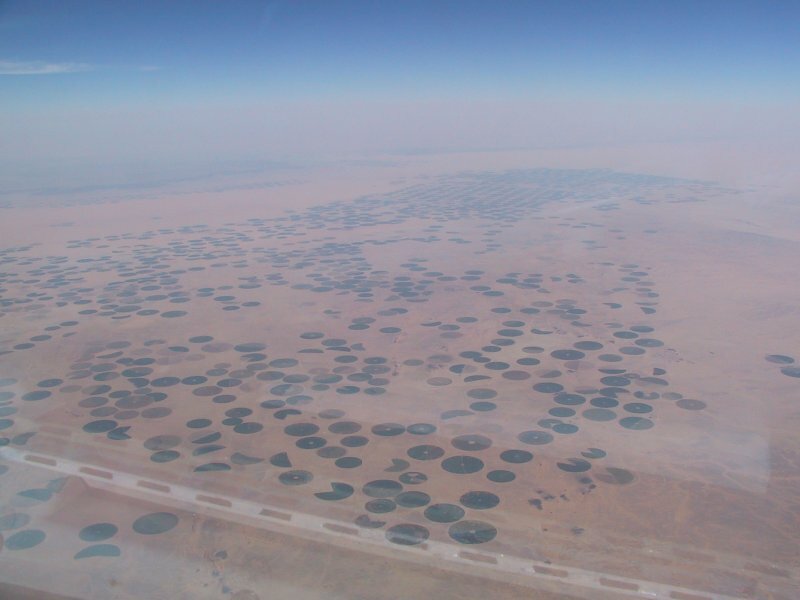 It's not commonly known, but Saudi Arabia grows quite a lot of wheat. 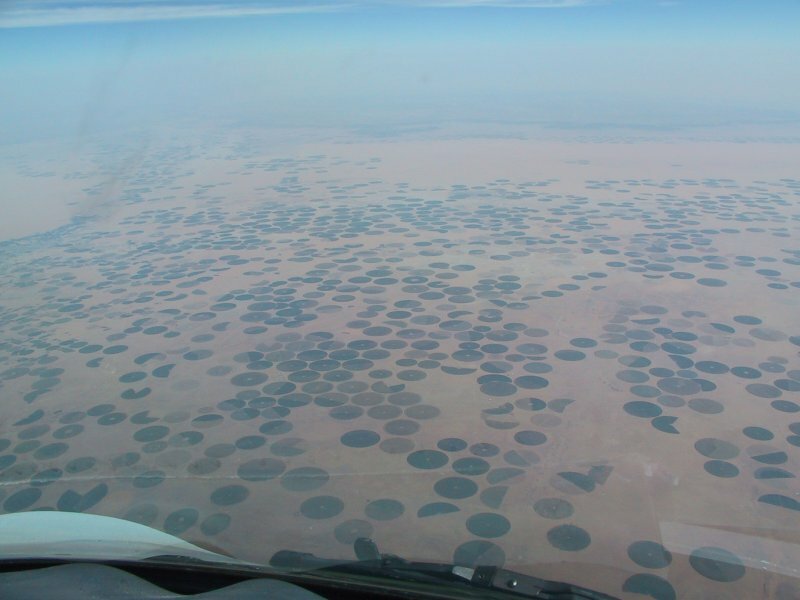 I'm not sure of the technicalities, but I think they have a lot of ground water that they pump up to water the wheat fields with. The watering equipment must go around in a big circle, as all the fields are round - They're also very large. 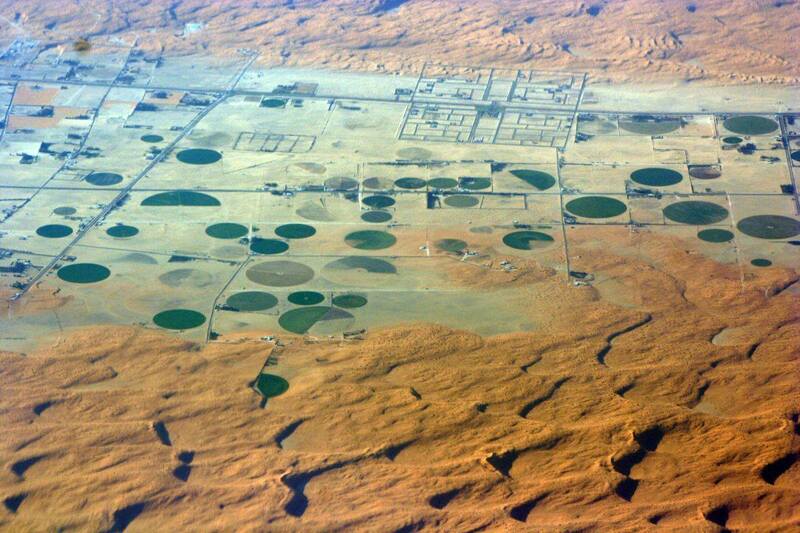 If you look at the first two photos you can see that there's thousands of those crop circles around the place (Those photos are of just one of many areas - Wadi Al Wasir - in the country) but you don't really get the perspective of how large they are. Look at the photo on the right and you'll see in between some buildings between the crops; large buildings, with little dots that're tractors near them. They're big! 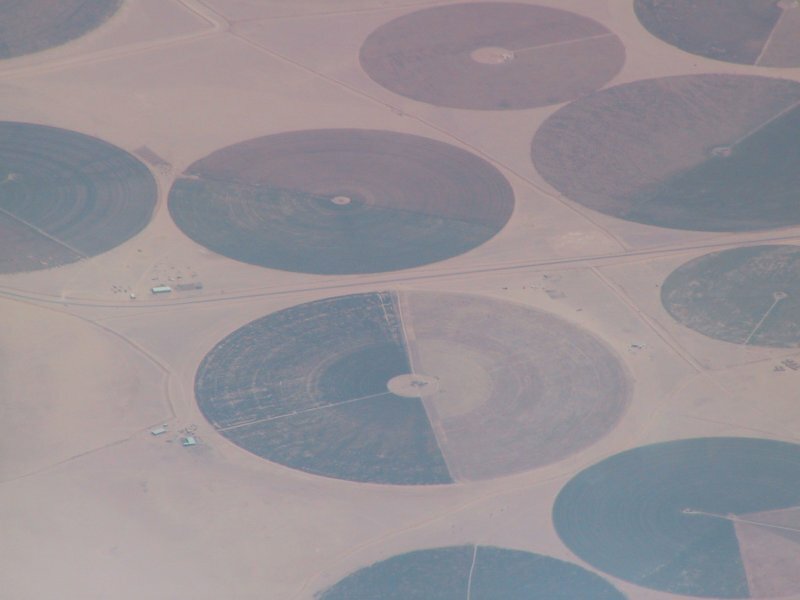 The photo on the far right is one I took in mid-June 2007 and it's of yet another area of extensive wheat crop circles, but this one was surrounded by a huge rolling desert. But as you can see, the desert moves around a lot as has partly reclaimed the cleared area. 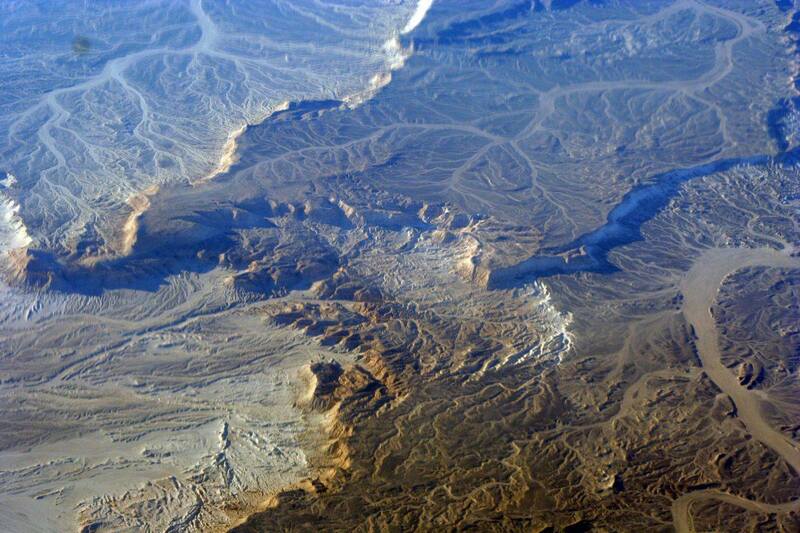 The desert areas of Saudi Arabia are rather varied, from simple flat sands to towering dunes to extremely rugged mountainous regions. 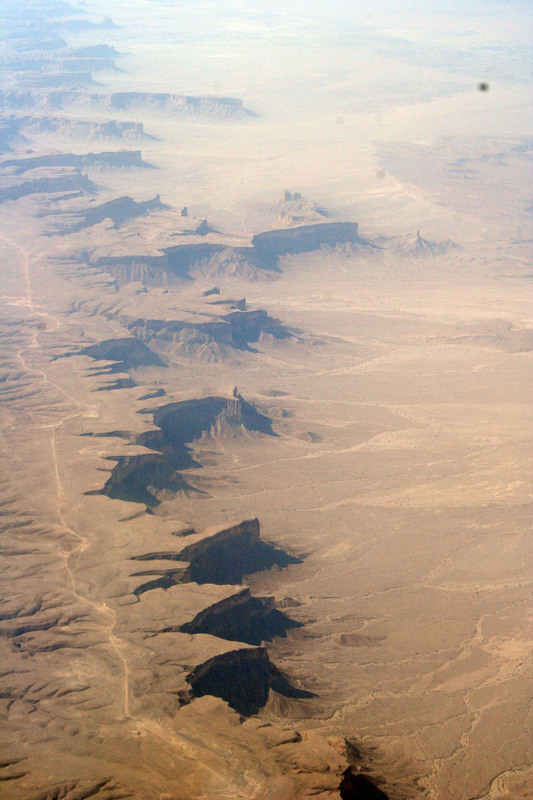 The two photos here show some of the spectacular cliffs in the central regions, the one on the right is near Riyadh. I'm not sure how tall those cliffs are but would have to be a few hundred metres for sure. 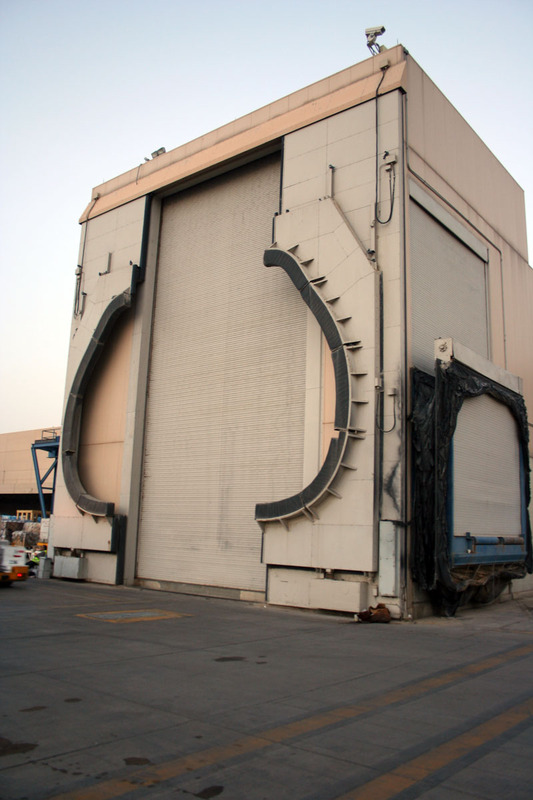 In Riyadh, because it's so hot (up to 50° at times) they sometimes put the front of 747's into a large air-conditioned hanger to do the loading. You park the plane up close to the door, then they tow it in the last little bit, with the nose of the plane open, then the doors on the side close to seal it in place. 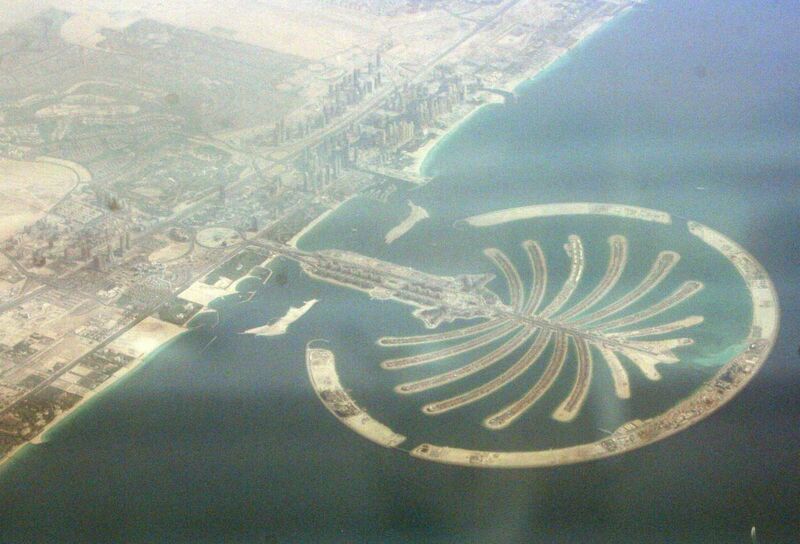 On the right is the huge artificial island, shaped like a palm tree, built off the beach at Dubai. It's just to the south of the main part of town. There's a another slightly larger one being build a little further south, and just to the north there's a much larger map of the world being built in the water, made up of hundreds of linked islands. 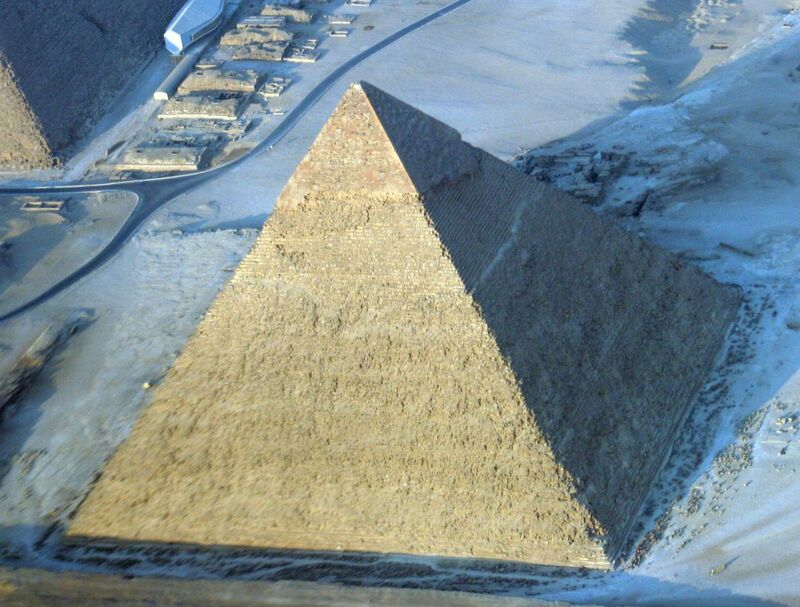 In mid-June 2007 I flew a few times into & out of Cairo, and I asked the air traffic controllers there to radar vector us over the pyramids. They did a great job of that and with the plane banked over the huge monuments were right under us as we turned to line-up with the runway. Yes, I knew they were big, but not that big! 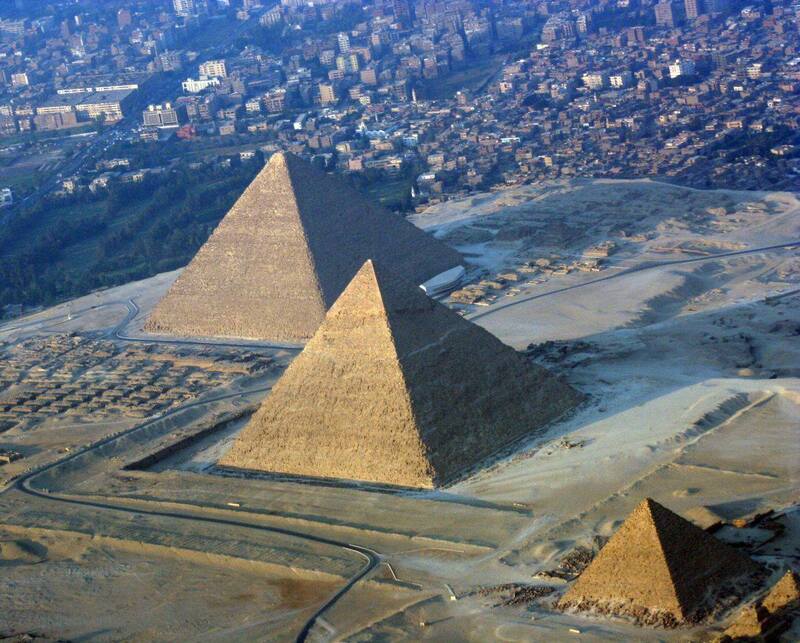 The other surprise is that they're pretty much surrounded by Cairo city. I'd always thought they were out of town some distance. 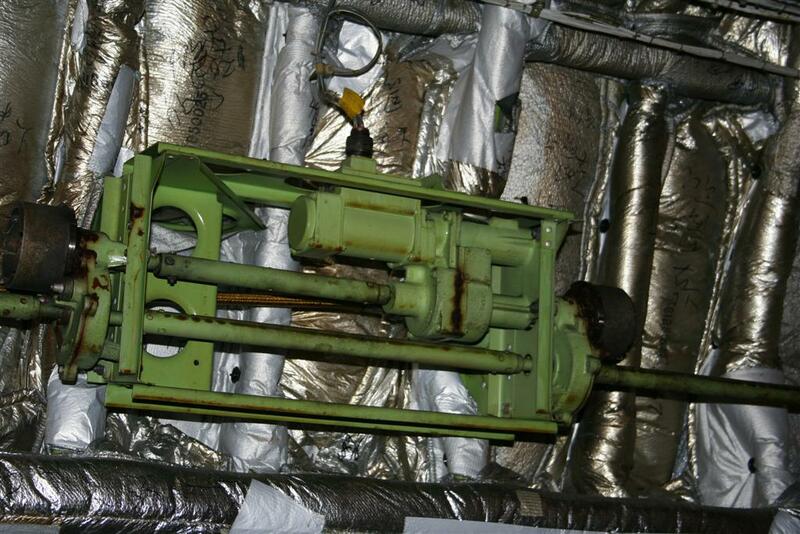 The 747 has pressure relief valves for the pressurisation system to stop the cabin from being over-pressurised. There's a total of four valves, two to a side, and the first ones to open work at 9.25psi, the second set at 9.6psi. You can see them (arrowed) just ahead of the leading edge of the wing root. In the 1970's (I think) Pratt & Whitney tried to build an alternate engine to the regular JT9D series, and also some more competition to the Rolls-Royce & General Electric big turbofan engines. The result was the JT9D-70A, and to put it bluntly they were rubbish. They made less power, used more fuel, weighed more, and used a lot more fuel than the rest of the JT9D series. Despite this, about 30 - 40 were sold and some still are flying as I type this. They look a great deal like a General Electric CF-6 series of engine, but are nowhere near the GE's standard ... 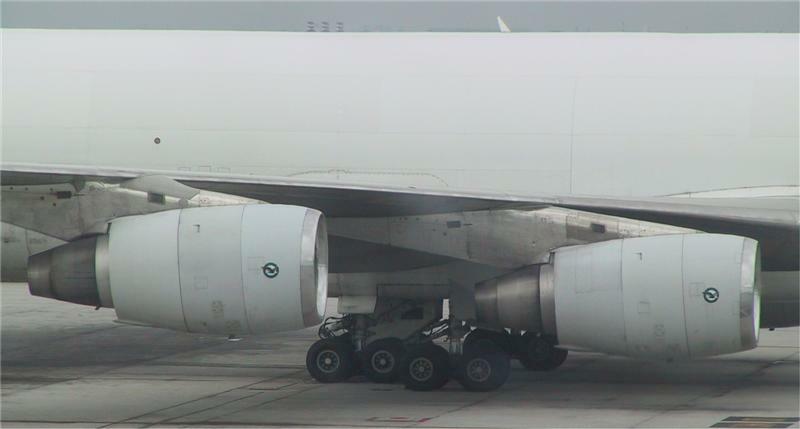 This photo was taken in Kuala Lumpur, and if you look carefully you can see the Pratt & Whitney logo sticker on the side of the engine cowling. The 747 is a very large aeroplane, and yet with the efficient flaps they have they can still slow down to a reasonable landing speed and take-off speed. 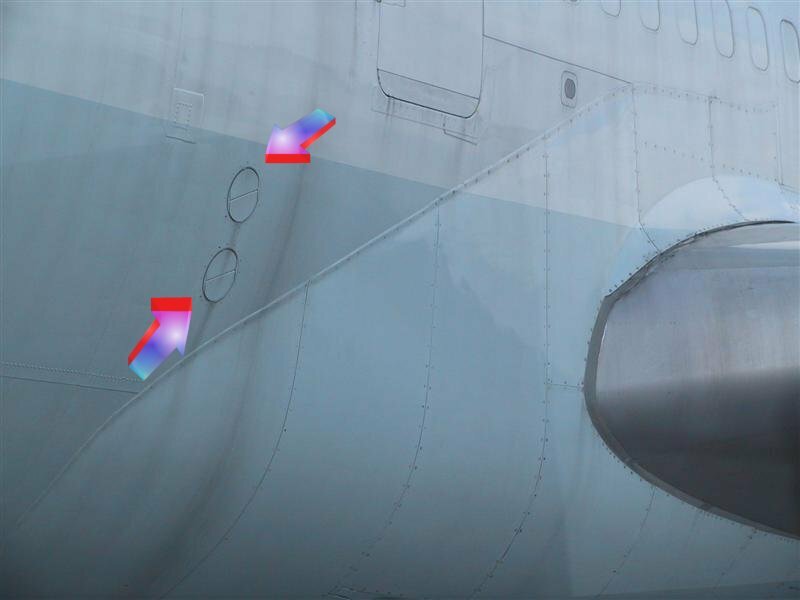 On the left is a placard from one of the 747's I fly that shows the stalling speed of a 747-200 with various flap configurations, from 0° flap to 30° flap, which is commonly used for landing. For take-off, we prefer to use flaps 20° to keep the wheel speed down but it's not uncommon to use flaps 10°, especially when terrain clearance requires a better climb away from the airport. 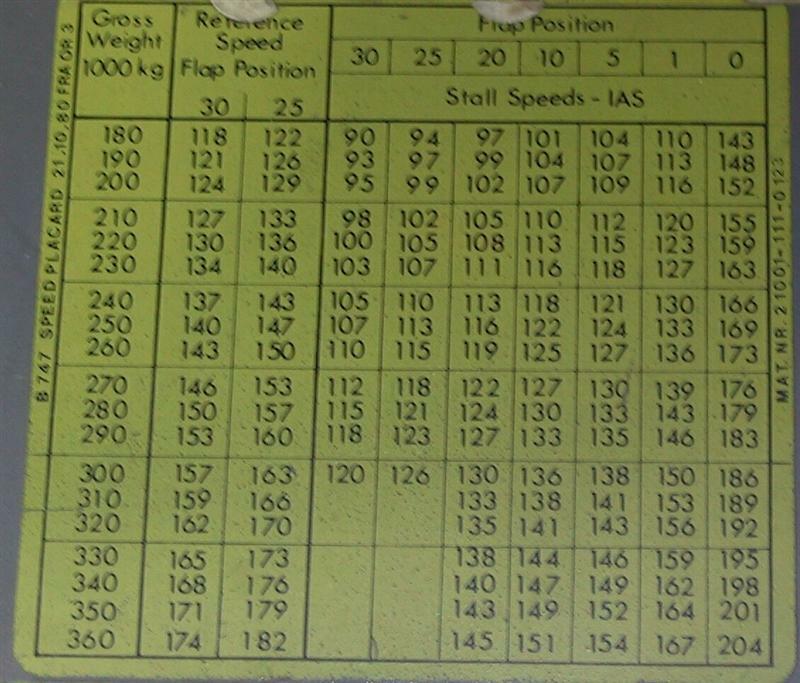 The 'Reference Speed' towards the left of the placard shows out actual approach speeds - The amazing thing is that at very light weights, with the flaps at 30°, the approach speed is not that far much more than much smaller aeroplanes, such as the Metro & Citation I used to fly. At a common landing weight of around 240 tonnes, this gives us an approach speed of 142 kts (we use Ref Speed and add 5 kts each time, for a small buffer) At maximum landing weight of 285 tonnes, we have a Ref Speed of 152 kts, and at that weight the brakes get fairly warm after stopping the big plane. 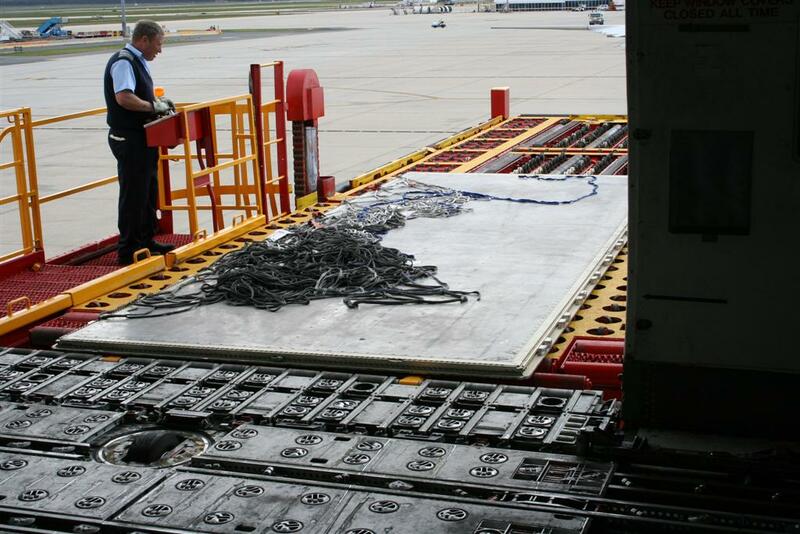 On the right is a device used to help cool the brakes if they need it, and with heavy-weight landings they often do. It's simply a small petrol motor that drive a fan, so as to blow air through the middle of the wheel assembly. If you put your hand where the air comes out, you can feel the high temperature in it. In mid 2005 we carried two horse hyperbaric chambers out of Melbourne. Each of them weighed sixteeen tonnes and only just fitted through the door. And I mean by maybe a couple of centimetres! In the photo on the right you can see they needed a small forest of straps to hold them in place. The chambers are used to help race horses heal faster and better from injuries, by exposing them to an atmosphere of about two bar (~30psi above ambient) of a high concentration of oxygen. 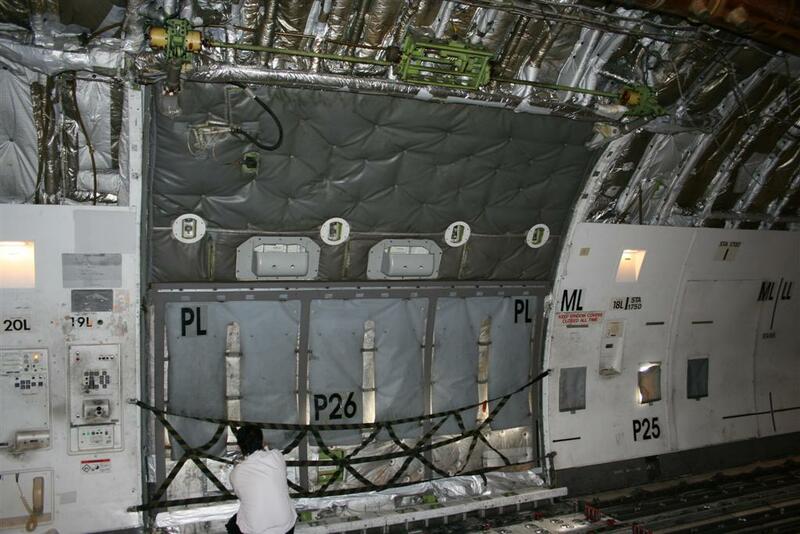 The rear freight door on the 747, as you'd expect, is quite large. You can get an idea as to the size of the thing by the guy squatting down in front of it. It uses a clever hinge mechanism to let it fold up right out of the way when moving freight. If you look up the top of the door in the left-hand photo you can see the small motor & gearbox that's used to open it. On the right-hand photo there's a close-up of that mechanism, and it surprises me how small it is - It's smaller than a car's starter motor. 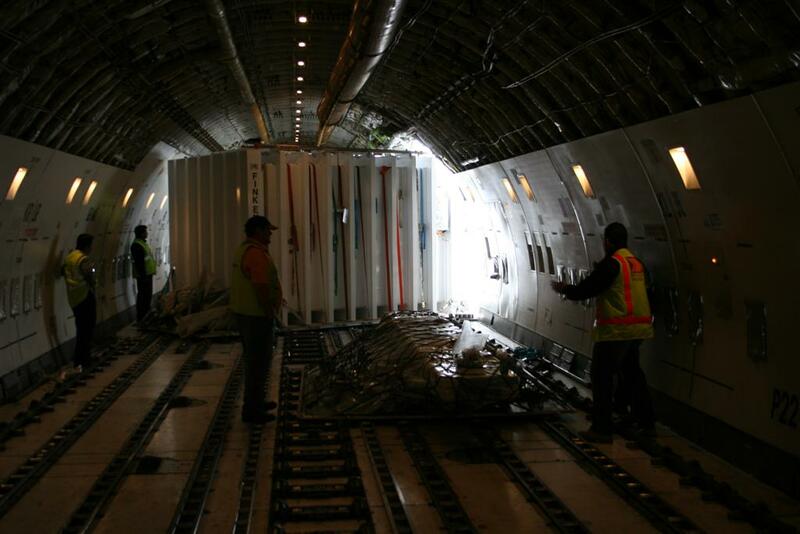 The freight is loaded onto flat alloy pallets, not into large containers as passenger luggage is. 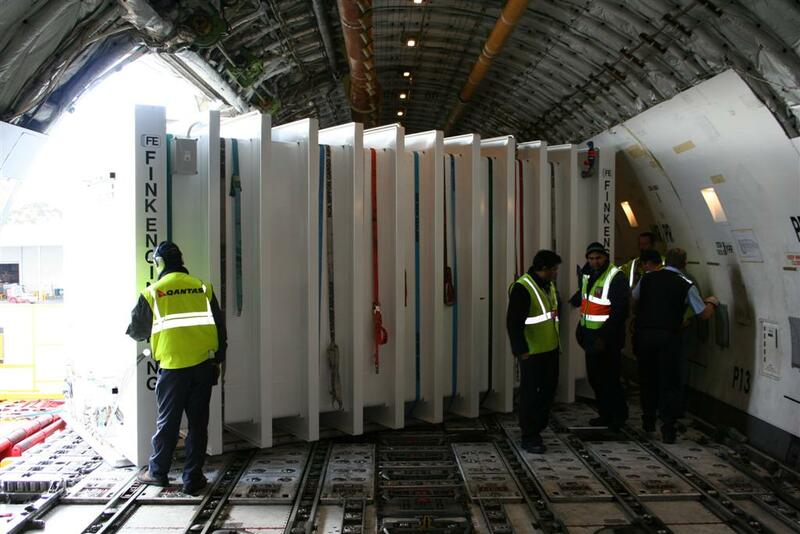 This makes loading the 747 very quick & easy - Though each pallet has a maximum height so it can fit through the rear door. 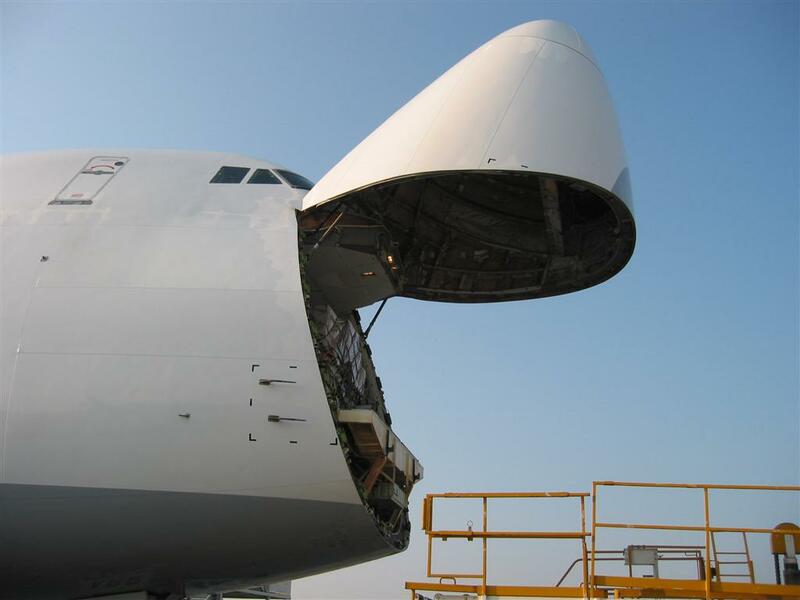 Some 747 freighters also have a nose door to get odd-sized freight in & out of the plane. They're not as common as they used to be though as section of roof in the main deck under the flight deck is lower than the rest of the main deck, so the pallets can't be as high as they can through the rear door. So they're really only used for freight that's very long, such as busses, long poles, and so on. It happens every now and then - a passenger sits on the bulge on one of the lower parts of the door in flight, despite clear signs not to. If they're unlucky it's enough to set off the escape slide, and that's really dangerous. If you're caught in a seat near the slide as it expands you stand a good chance of having broken ribs and the like as you're crushed into your seat. 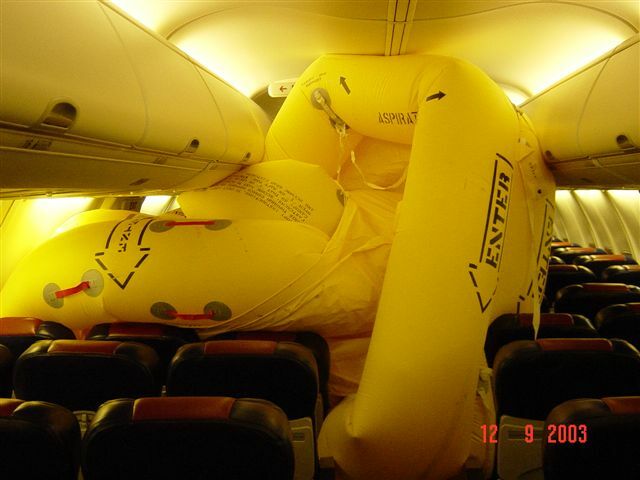 On the right is a bit of a laugh on a couple of our 747's. 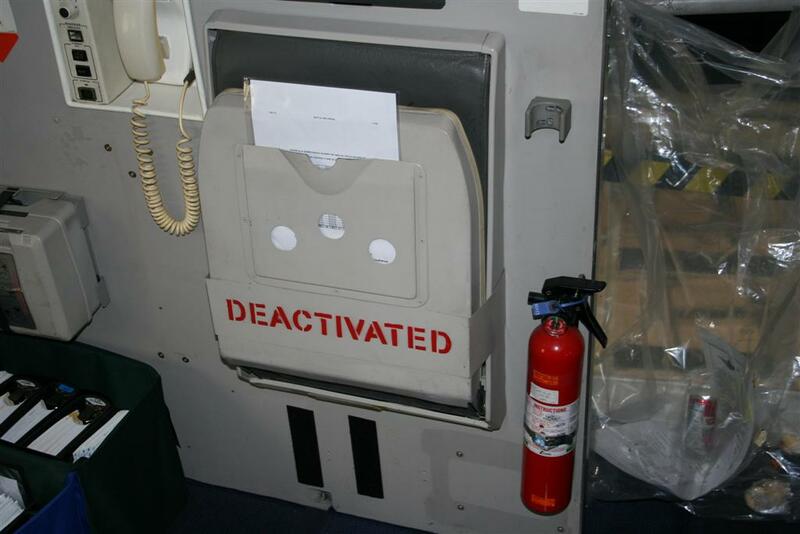 For some reason when they were converted from a passenger 747 to a freighter 747, the Flight Attendant seat in the upper deck was not to be used any more - Fair enough - But to do that, someone has unbolted the seat, then fitted the strap to hold it shut and have the word DEACTIVATED on it, then bolt it all back on again. Wouldn't it just have beeen easier to take the seat off ... ? 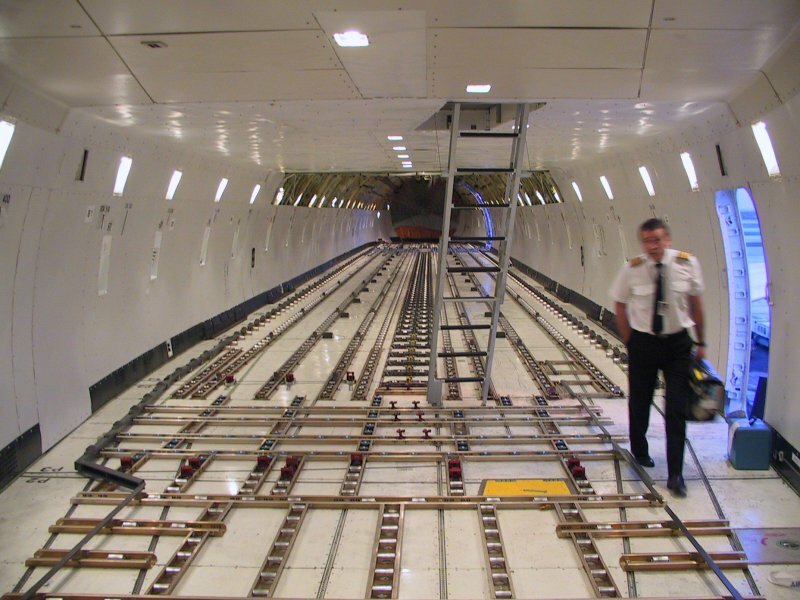 This is the complicated flap track system on the 747. The 747 has a triple-slotted flap and so as well as lowering the flaps, the mechanism extends them backwards a long way to increase the wing area for more lift, and also as they extend the angle increases & gaps get wider. The huge flaps are moved by means of powerful hydraulic motors and thick screw-jacks. If the hydraulics fail, there's an electronic backup system. 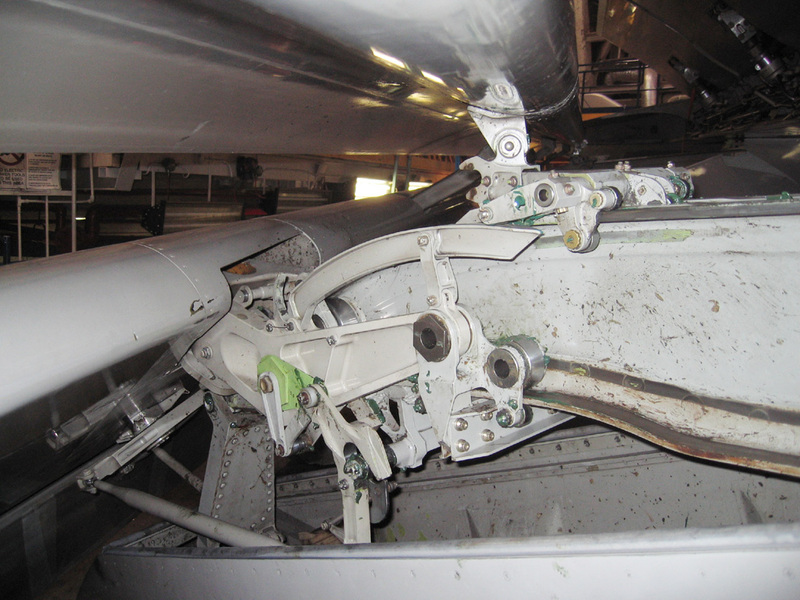 The big failings you see under the wings of airliners cover-up these tracks and mechanisms, but it's possible to get permission to fly without them if need be. Take a moment to find out what happened on Man's first powered flight - It's not what you think! More Aviation links can be found on my Links page.